Thank you for your continued interest in Sony products. This page provides instructions on how to update the firmware for Linear PCM Recorder PCM-D100. Note: In case the firmware version of the unit is already 1.01, there is no need to apply this firmware update program. Under certain conditions, (fast forward) and (fast backward) functions do not work correctly showing “FLAC” on the display. This symptom has been improved. Turn the linear PCM recorder On. Press and hold the HOME/BACK button, then the HOME Menu is displayed. Select Settings > Common Settings > System Information. Confirm the Firmware version on the display. Trouble-free operation on all computers is not guaranteed. - Personally assembled computers or installed operating systems. Confirm that remaining battery amount shown at indicators in the display window of the unit are full. If battery power runs out during the firmware update, the firmware update may not succeed. Save a backup copy of recorded messages and data in your linear PCM recorder to your computer. It is strongly recommended that you copy recorded messages and data in your linear PCM recorder to your computer before updating the firmware, just in case data loss of the linear PCM recorder occurs due to this firmware update. Sony Corporation will not assume any liability to the owner of the linear PCM recorder for any damage including data loss due to this firmware update service. Download the firmware update program to your computer by clicking I accept which appears at the end of this page. Then, the file download will start. We recommend you to save the update file on your computer desktop. To check the file size, right-click on the downloaded file and select Properties. Properties of the file are displayed, and confirm the file size. If the size is not the same as the one shown above, try downloading the file again. To check the file size, select the downloaded file on the icon and choose “Get Info” from the File menu. Then, click the General disclosure triangle to see the file size. If the size is not the same as the one shown above, try downloading the file again. * Depending on computer configurations, you may not be able to extract the file as shown below. 1. Right-click on the file “PCM-D100_V101.zip” and click Extract All. 2. The file “PCM-D100_V101.zip” is open and is displayed. Confirm that the below file is in it. This file is the firmware update program. * Depending on your computer configurations, the file extension “.UPG” in the filename “PCM-D100.UPG” may not be displayed. 2. Confirm that the file is extracted and the file “PCM-D100.UPG” is created on computer desktop. This file is the firmware update program. Connect the linear PCM recorder to the computer. 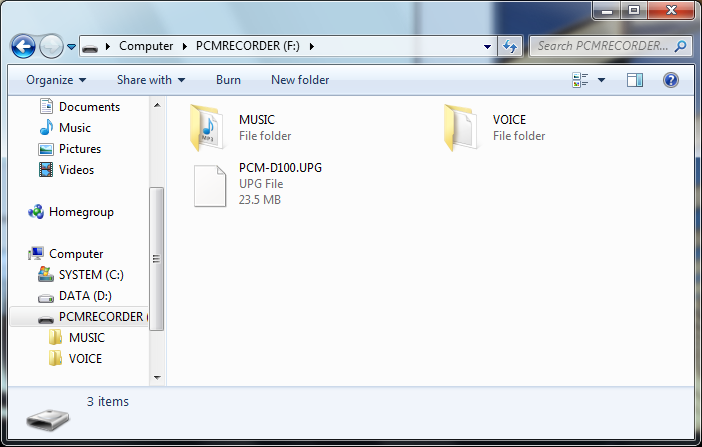 Copy the extracted file (filename: PCM-D100.UPG), which you have extracted as described in the section [Download procedure], to the root directory that is located immediately below “PCMRECORDER” on the computer. - Depending on your computer configurations, the file extension “.UPG” in the filename “PCM-D100.UPG” may not be displayed. - The above picture shows Windows 7 explorer. Disconnect the PCM recorder from the computer. Update screen appears in the display window of the linear PCM recorder and firmware update starts. Firmware update will complete in about 1 minute, and the stop mode display or clock setting display appears. The update file in the linear PCM recorder will be automatically deleted. If you use the alkaline batteries, replace all of them with new ones. If you use the Ni-MH (Nickel-Metal Hydride) rechargeable batteries, replace all of them with charged ones. If you use rechargeable batteries in the target product (for this update process or for ordinary use), please use only either the Ni-MH (Nickel-Metal Hydride) rechargeable batteries accompanying the target product or any of such models of Ni-MH rechargeable batteries as are listed as available accessories in the instruction manual of the target product. Delete some of recorded messages of data in the unit, or transfer them to the computer to available disk space more than 35MB. Then, start updating, again. Please confirm the firmware version when the update program is installed successfully. The update program installation is succeeded when 1.01 is shown in the display window.